A 100% acrylic elastomeric pourable crack sealant designed for sealing cracks up to 1/2″ wide in asphalt or latex/rubber track surfaces. Approximately 150-200 linear feet of 1/2” wide x 1/2” deep cracks per gallon. 100% acrylic elastomeric pourable crack sealant. 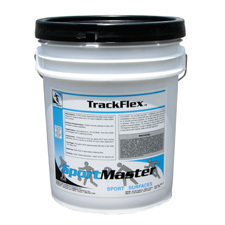 TrackFlex is an elastomeric cold pour crack sealant designed for use in cracks up to 1/2” wide on asphalt boung running tracks. TrackFlex maintains excellent flexibility, elasticity and adhesion at temperatures as low as -20°F. Asphalt running tracks and other pavement surfaces. Cracks must be cleaned of dust, dir t , and debris including vegetation. Blow clean with an air compressor or high pressure washer. Fill deep cracks with sand or backer rod to within 3/4” of surface. Use product as is. Do not dilute. Pour into crack until it is filled completely. Set time is dependent upon temperature, humidity, and sealer thickness. For best results, apply on dry surface when surface temperature is not expected to drop below 50°F or exceed 120°F. Strike off with squeegee to assure flush contour of finished application. Do not store in direct sunlight or where temperatures exceed 100°F. Do not apply if rain is imminent or forecast. Keep from freezing. Close container when not in use. Patches should be allowed to dry 24 hours. 5 gal. Pail 47 lbs.